to write the terms, coefficients and factors of an algebraic expression. to classify an algebraic expression as monomial, binomial, trinomial. to add and subtract algebraic expression. multiplication and division of given polynomials. the difference between an identity and an equation. algebraic identities and their applications. factorization of algebraic expression by regrouping , by taking common factors or using algebraic identities. Constants and variables : A quantity having a fixed numerical value is called a constant whereas variables in algebra are letters such as x, y, z or any other letter that can be used to represent unknown numbers. Algebraic expression : An expression which has a combination of constants and variables connected to each other by one or more operation (+,-,X,÷) is called an algebraic expression. Term : The parts of an algebraic expression separated by an addition or a subtraction sign are called terms of the expression. In the expression the terms of the expression are are variable terms as their values will change with the value of x, while (-4) is a constant term. On the basis of the number of terms in an algebraic expression, they are classified as monomials, binomials, trinomials and polynomials. Monomials are algebraic expressions having one term . Binomials are algebraic expressions having two terms. Trinomials are algebraic expressions having three terms. Polynomials are algebraic expressions having one or more than one term. Remember – Only expressions with positive powers of variables are called polynomials. An expression of the type is not a polynomial as and the power of variable p is (- 1) which is not a whole number. Classify the algebraic expressions as monomials, binomials or trinomials. 3p 3q2, 7p 3q2and 9p 3q2 are also like terms. 3p 3q2 are unlike terms. In algebra, like terms can be added or subtracted. To add or subtract algebraic expressions we can use the horizontal method or the column method. All algebraic expressions are written in a horizontal line; the like terms are then grouped. The sum or difference of the numerical coefficients is then found. In the column method, each expression is written in a separate row in such a way that like terms are arranged one below the other in a column. The sum or difference of the numerical coefficients is then found. To add by horizontal method, collect the like terms and add coefficients. Add the following algebraic expressions. Subtract the sum of from the sum of . Two adjacent sides of a rectangle are . What will be the perimeter of the rectangle. The perimeter of a triangle is and the measure of two sides is . What will be the measure of the third side? What should be added to to get . By how much is greater than . Multiply the literal coefficients and use laws of exponents if variables are same. The product of two monomials is always a monomial. The area of a rectangle is given by the product of length and breadth. Thus, it can be said that the area of a rectangle is product of two monomials. Multiply the monomial by the second term of the binomial. The product of a monomial and a binomial is always a binomial. Let us draw a rectangle ABCD with length (p+q) and breadth k.
Take a point P on AB such that AP = p and PB = q. Draw a line parallel to AD from the point P, PQâ«½AD meeting DC at Q. Thus, the product k(p + q) represents the area of a rectangle with length as a binomial (p+q) and breadth as a monomial k.
The product of a monomial and a polynomial is a polynomial. MXâ«½AD and NYâ«½AD meeting DC at X and Y. Thus, the product of a monomial and a polynomial represents the area of a reactangle with length as a polynomial and breadth as a monomial. To multiply two polynomials, we will use the distributive property that is multiply each term of the first polynomial with each term of the second polynomial. If the length of a rectangle is and breadth is 3abc,find the area of the rectangle. An identity is a special type of equation in which the LHS and the RHS are equal for all values of the variables. The above equation is true for all possible values of a and b; so it is called an identity. An identity is different from equation as an equation is not true for all values of variables,;it has a unique solution. 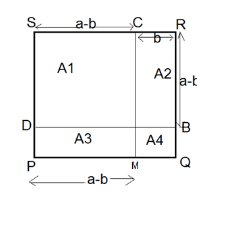 Draw a square with length as shown in the figure. Mark a point M on PQ such that length of PM = a and length of MQ= b. Draw a line MC parallel to PS intersecting SR at C.
Similarly, mark a point B on RQ such that RB = a and QB = b. Draw a line BD parallel to QP intersecting PS at D.
We draw a square with length a as shown in the figure. 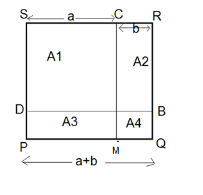 Mark a point M on PQ such that the length of PM = a-b and length of MQ= b. Similarly, mark a point B on RQ such that RB = a – b and QB = b. "Maths Teaching Guide: Algebraic Expressions." UKEssays.com. 11 2018. All Answers Ltd. 04 2019 <https://www.ukessays.com/essays/mathematics/maths-teaching-guide-algebraic-expressions.php?vref=1>. "Maths Teaching Guide: Algebraic Expressions." All Answers Ltd. ukessays.com, November 2018. Web. 25 April 2019. <https://www.ukessays.com/essays/mathematics/maths-teaching-guide-algebraic-expressions.php?vref=1>. UKEssays. November 2018. Maths Teaching Guide: Algebraic Expressions. [online]. Available from: https://www.ukessays.com/essays/mathematics/maths-teaching-guide-algebraic-expressions.php?vref=1 [Accessed 25 April 2019]. UKEssays. Maths Teaching Guide: Algebraic Expressions [Internet]. November 2018. [Accessed 25 April 2019]; Available from: https://www.ukessays.com/essays/mathematics/maths-teaching-guide-algebraic-expressions.php?vref=1.